Home NY Times A Norwegian Air Jet Landed in Iran 4 Weeks Ago. It Can’t Leave Yet. And under the Trump administration, she said, getting such a license could be a battle. When sanctions on the nuclear program were lifted in 2016, the United States granted Boeing and Airbus licenses to sell aircraft to Iran. Those licenses were canceled when the sanctions were restored. Airbus delivered three planes, but for now has lost out on most of a $ 19 billion order from Iran Air, the national carrier. Boeing agreed to sell 80 passenger jets to Iran Air but never began building them. A small European manufacturer of regional jets, ATR, part-owned by Airbus, also delivered 13 planes and was lobbying the United States to be allowed to sell more. Iran would welcome any company able to provide its flag carrier with the new planes it needs. “We even have gone after planes such as Sukhoi 100 or planes made by non-European countries,” the chief executive of Iran Air, Farzaneh Sharafbafi, was quoted as saying last year on Iran’s Roads Ministry website, according to Reuters. Sukhoi has said that it “continues to reduce the number of foreign components” it requires for its Superjet 100, a narrow-body regional aircraft, and that is working on a new version. It said it had applied for a license to export the current version, built with more than 10 percent of components from the United States, but has not received a response. 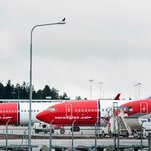 Experts agreed that Norwegian Air’s misfortune was a rare example of the severity of the sanctions. Many Western airlines routinely fly over Iran, considered a safe airspace in the region, but few international companies operate out of its airports. British Airways, Air France and KLM restarted flights after the 2015 deal, but suspended their routes to Tehran last year. British Airways said the route was not commercially viable. “It’s an example of how this sort of sanctions is a dampener on safe international aviation,” said Andrew Charlton, managing director of the consulting firm Aviation Advocacy. Tags: Ago., Can’t, Landed, leave, Norwegian, Weeks, Yet…, Иран.